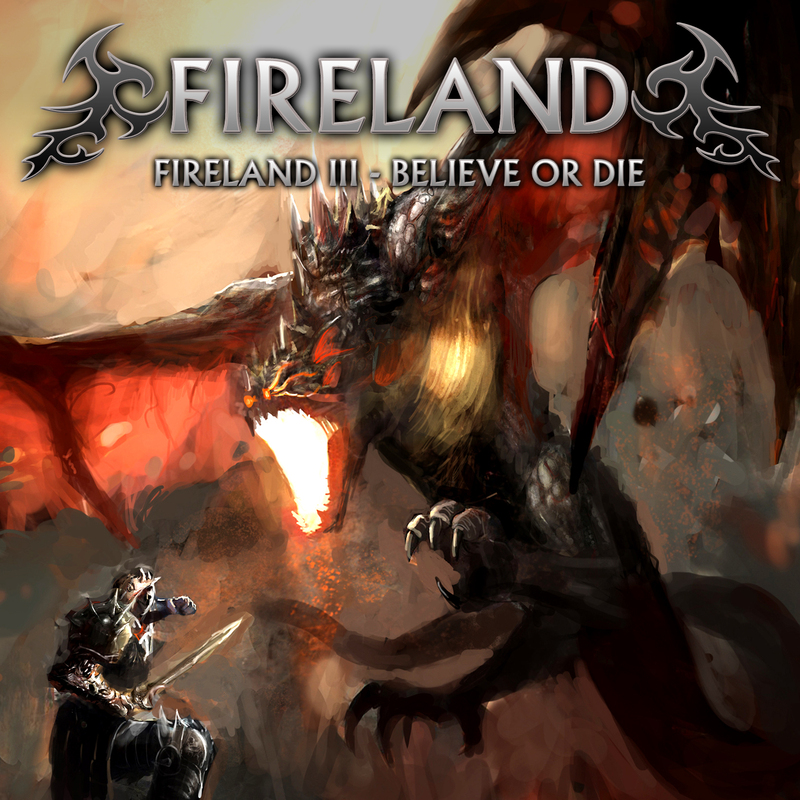 FIRELAND remains the sole property of Steve Moore. Having put his RIFFMASTER GENERAL band on ice, he set about to create a band in his own image and promote his own ideas. A series of EP’s and one album was released, along with high profile festival spots at Wacken and Bloodstock, followed with supports to to the likes of DRAGONFORCE, BLITZKREIG, DORO and GIRLSCHOOL. And then all went quiet. Mo0re joined STORMZONE and many assumed that was that. The Northern metallers have developed quite a name for themselves recently in terms of studio output and live performances. It would be natural to imagine the higher profile would have satisfied his aims. But no. He is back with regular drummer, Chris Mawhinney, and David Brown of progressive metallers CHAOS FRAME. The question remains….is it any good? The answer is… It really shouldn’t be… BUT!!! Listening to heroic journeys involving danger, risk and sacrifice in order to combat against evil forces for greater goals. It instantly sounds like cheese. But it does work. The vocals are a bit histrionic but the band is significantly tougher. The elements of HELLOWEEN, GAMMA RAY, PRIMAL FEAR are still present but there seems to be more. You could perhaps imagine RIP era MEGADETH churning out similar riffs. The initial set of songs ‘I’m John Rock’, ‘Believe or Die’, ‘My Enemy’s Enemy’ and ‘Ironclad’ are all songs that will doubtlessly encourage fist pumping and sing-along’s at festivals. The guitar lines are impressively varied and the drumming helps drag it out of the ordinary. ‘Burning Scarecrow’ follows in similar trends but the vocals are substantially grittier and a credit to the ability of Brown. ‘Hell Hotel’ kicks off with a vibe that could easily be mistaken by a thrash band at the turn of the eighties. Probably one of the best tracks on the album. A lot has been made of the ‘Fallen II’ track which was a continuation on from their “Fireland II” EP. To me, it doesn’t need over nine minutes and drags attention away from the album. Brown is allowed to stretch out his full vocal capacities but the material is not really strong enough to support it. The guitar work is solid throughout going from melodic to thrashy but the lyrics are a bit cringeworthy. Even for power metal. The big ballad moment comes in the guise of the unfortunately titled ‘Murderhole’. It is difficult to imagine too many women holding their lighters up to that. Still for those that grew up in the metal ballad era it is not that bad. I certainly have heard worse. Closing numbers ‘Hate Will Live On’ and ‘Rise again’ are metal by numbers. The former sees the band employ more of a modern sound which doesn’t really match up with what came before and the latter is decent enough but nothing that has not been heard before in the album. They conclude with a bonus cover of AGINCOURT’s self-titled number. Distinctly thrashy and powerful it sets off the album in the right way. What the band does now is really up to Moore. No doubt the offers of festival dates will be coming in at the moment. Whether he or Brown have the time in their schedule to be able to fulfill them is another thing. I would find it difficult to step away if I found myself seeing them in the future and that is saying something.